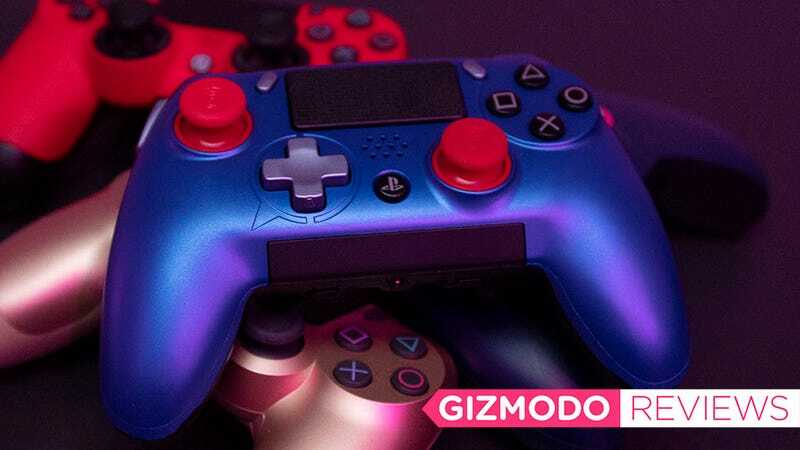 It’s taken more years than it should have, but it’s finally here, a PS4-friendly answer to Microsoft’s ultra-customizable Elite controller. The Scuf Vantage might look like a weird third-party peripheral of old, but this officially licensed controller finally delivers all the weird little tweaks I demand, except now configured to actually work with my PS4. 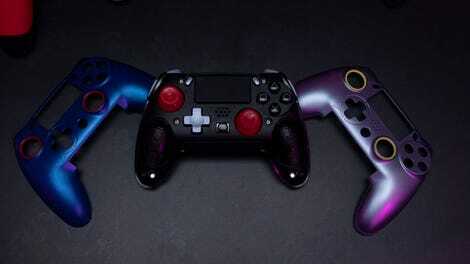 The most customizable controller yet for the PS4. The incredible customization and the ease of that customization. It's a little pricy, the the layout takes some getting used to. That hasn’t quite been possible before. While there are a number of controllers that work for the Xbox One or Windows machines (the aforementioned $150 Microsoft Elite controller is the best-known one), PS4 owners have really been limited to PS4 controllers, or Scuf’s Infinity4PS controller (starts at $138 but with customizations can cost as much as $210). I really liked the Infinity4PS, and when I reviewed it, I went so far as to say it was the controller to buy if you were a PS4 owner. (Its sibling, the Infinity1, is super for Xbox One owners.) But the Vantage improves on the Infinity4PS in a variety of ways that make its price tag, $170 for the wired version and $200 for the wireless one, feel pretty close to warranted. See the Infinity4PS is incredibly customizable, but you have to make a lot of decisions about that customization as you order the controller, which isn’t ideal for something as tactile as a game controller. Controllers are like keyboards in that you need to try them out and actually see how they feel to know if you like them. And some of those customizations add on to the price tag—which means you could blow a lot of cash on a device that wouldn’t feel excellent to you. In fact, customizing the Infinity4PS to even close to the level that the Vantage allows actually leads to the Infinity4PS costing more. The one I configured similarly to the Vantage would cost $207. Spending that doesn’t make a lot of sense, particularly as the Vantage still wins on the customization front. For starters, the D-Pad can be switched out for a circular pad which makes hitting diagonals easier in fighting games. There are also two new buttons on the sides called “Sax buttons” that can be mapped to function as any other buttons on the controller. The remapping is easy, you flip a switch on the bottom of the controller and press the two buttons that are being remapped. Too lazy to reach from the R1 trigger to the R2 trigger? Then you can map the right Sax button to act like the R2, pressing it with the middle of your finger as you keep the tip on the R1. The Sax buttons on the left and right can be mapped to any input on the controller. I didn’t though, and in fact I left the Sax buttons unmapped because I kept accidentally bumping into them while I play. People with longer fingers, or less stupid fingers, likely won’t have that issue. There are also not two, but four paddles on the rear of the controller that, as with the Sax buttons, are remappable. I only wound up using two of them in my gameplay, as the two closest to the center were just far enough away to be uncomfortable to hit regularly. But remapping the outer ones to the R3 and L3 buttons (the buttons you press by jamming the right and left joysticks down) was a game changer. Instead of having to press down on a joystick to run or punch in Destiny 2, slowly wearing the nub down, I can lightly press a paddle now. It’s so easy and more ergonomically friendly that I kind of feel like I’m cheating, especially in PVP where in my excitement I’d miss a joystick press at key moments and wind up dead too often. The paddles on the back are great! Speaking of the joysticks, they can be switched out, too. If you play a lot of games, joysticks inevitably wear down and end up looking and feeling disgusting. I’ve gone through three PS4 controllers in four years because of this, and the desire for replaceable joysticks led me to Scuf to begin with. But the Vantage improves dramatically on previous Scuf controllers, which required a special tool and a tedious procedure to replace the joysticks. Now you just pop them in and out. It’s so easy you can switch them between loading screens if you so desire. And unlike the replaceable joysticks found in the Microsoft Elite controller, the Scuf joysticks are sturdy and won’t pop off should you drop (or throw) the controller. It’s easy to remove that red trigger and go with a shorter one if you so choose. Remapping is as easy as flipping a switch. You can even pop out the rumble packs! The triggers on the back are, you guessed it, adjustable as well. A teeny tiny tool lets you adjust the tension of the triggers, while a switch lets you adjust draw length. Scuf also includes alternative trigger panels for the L2 and R2 triggers that are much longer, making them incredibly comfortable for extended play in something like a Destiny 2 or Spider-Man. Twist that little nob and the draw distance of the trigger cuts in half. Though it won’t register the pull in some games, like Destiny 2. The best part of all of this is that besides the tension adjustment on the triggers, every single customizable aspect of the Vantage can be tweaked without tools. I can switch out faceplates or pop out the rumble packs in an instant. It’s every bit as easy to do as with Microsoft’s Elite controller, but it feels much sturdier too. With the Elite, a joystick or D-pad would pop off with one bad drop. That hasn’t been the case so far with the Vantage. In fact, the one downside of the Vantage so far is it has that goofy third-party controller look. You know the one. With older generations of consoles there were a wide variety of peripheral makers producing controllers, and they always looked kind of cheap and silly, Like a knockoff your grandparents would buy you at the drugstore. The thing looks kind of goofy, but the options for faceplates is nice. The Vantage is clearly inspired by the Xbox controller, with the joysticks positioned in the same locations as on the device, but ergonomically it’s not quite the same. I can move between a PS and Xbox controller and my hands won’t notice the difference. They definitely do with the Vantage though. The reach to the right thumbstick is a little longer than it is on either the Xbox or the PlayStation controller. I’ve used it for about a week, and that first day I died a lot. So much of controller use is tied to muscle memory, and my muscles had to make a lot of new memories to get as comfortable with the Vantage as they were with the Xbox or PS controllers. Actually, I’d hazard to say that my hands are more comfortable now! Adjusting the height of the thumbsticks, remapping the paddles, and tossing some nice long triggers on the back of the Vantage has created a controller that feels tailored to me, and one that is a cinch to use, and will be a cinch to customize for someone else should I have to loan it out. If you’re a PC gamer looking for something different this is it, and if you’re a PlayStation owner who has been envious of the controller options available to your friends on the Xbox and the PC, then the time has finally come—you’ve got a controller that isn’t just as good—it’s actually better. The Scuf Vantage is expensive! The Infinity4PS starts at $138, while a Microsoft Elite controller starts at $150. The Vantage starts at $170 for wired and $200 for wireless. But seriously, it’s so customizable that might not matter for you. The layout is slightly different though. So expect a little learning curve. Included in the box: Controller, very nice USB cable, case, 2 x short concave thumbsticks, 2 x medium dome thumbsticks, 1 x control disc, 1 x D-Pad, 2 x short trigger covers, 2 x long trigger covers, 4 x friction rings for thumbsticks, 2 x removable rumble packs, 1 x rumble pack case (also useful for all the other stuff! ), 1 x wrench for adjust triggers.